The land of Jordan lies along an ancient and well-used trade route. A country filled with ancient monuments, stunning nature reserves and seaside resorts. The most famous is the archaeological site of Petra, the Nabatean capital dating to around 300BCE, set in a narrow valley with tombs, temples and monuments carved into the surrounding pink sandstone cliffs. Below are a few interesting facts about Jordan that we have put together. Maybe these will help to entice you to visit this wonderful country and its many treasures. 1. 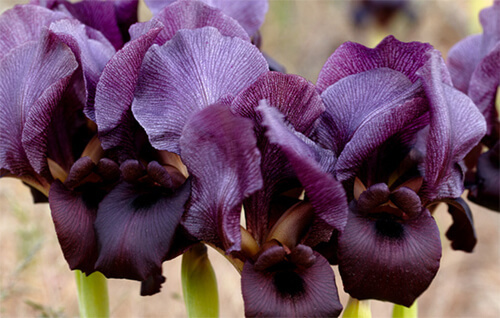 The stunning black iris is Jordan’s national flower. It is incredibly rare and grows only in Wadi Rum in spring. 2. Jordan is one of the most welcoming countries and Jordanians take great pride in their hospitality. 3. It is widely believed that Mount Nebo in Jordan is the burial place of Moses. 4. One of the Seven Wonders of the World, the city of Petra, was literally carved into rock over 2000 years ago. 5. John the Baptist is known to have been imprisoned in a palace named Mukawir, which is located just south of Madaba. 6. In ancient times, Jordan used to be a segment of the Fertile Crescent, in an otherwise arid part of the globe. Dead Sea in Jordan, lowest point on earth. 7. The Dead Sea is 67km long, maximum width of about 18km, and its salinity is about nine times that of the oceans. Its surface is about 418m below sea level, and its shores are the lowest land points on Earth. 8. The Baptism site by the Jordan River is one of modern biblical archaeology’s most notable discoveries. It is believed that this area called Wadi Kharar is where John the Baptist resided and was the baptism place of Jesus Christ. 9. The Jordanian capital, Amman, was originally constructed across 7 hills. The city now spans 19 of them. 10. Lawrence of Arabia, this British Army office based himself mainly in Wadi Rum, an area of a spectacular rock and desert formations.